A new report from USC’s Center for Urban Education (CUE) details how one community college implemented campus-wide academic pathways while maintaining its focus on racial equity. Pathways, Partnerships, and Progress: Transforming a Community College tells the story of the partnership between CUE and Los Angeles Trade-Technical College (LATTC), and how researchers and higher education practitioners overcame common barriers to improve outcomes for students. This week, the California Committee on Awards for Innovation in Higher Education announced that LATTC will receive a $2 million award for boosting completion rates and making postsecondary education more accessible. Community colleges across the nation are using the pathways approach planning. LATTC’s approach is different. Through visionary and equity-minded leadership, collaboration, and clear communication LATCC has created a culture of student-focused change that led to an innovative pathways program that benefits all students. 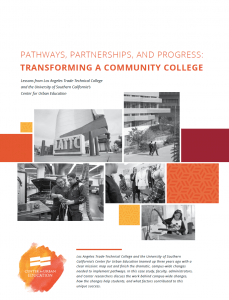 This report illustrates how LATTC succeeded – and how other community colleges can follow in their footsteps. The full report contains tools, infographics, on-site photos, and profiles of CUE and LATTC leaders who made this success possible. Click here to read LATTC’ story and learn more about how CUE is using the methods of equity-minded action research to support practitioners to understand and improve their practices so that more students can excel and reach their goals.